Just 5 races remain before the start of the Monster Energy NASCAR Cup Series Playoffs. Today it’s the Go Bowling at the Glen. 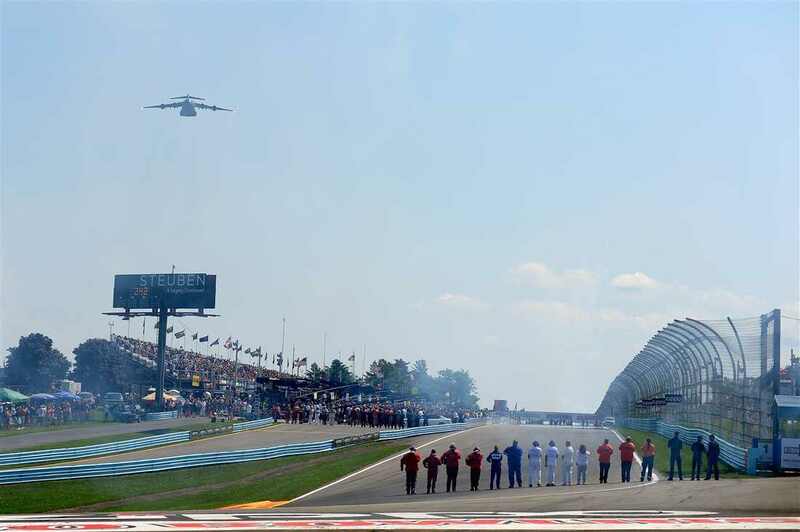 From Watkins Glen International, the road course in the Finger Lakes region of New York State. The 90 Laps that make up the 220.5 race are contested over 7 twisting turns. On what is often called the super-speedway of road courses. The Glen is where everyone says a surprise winner could emerge. 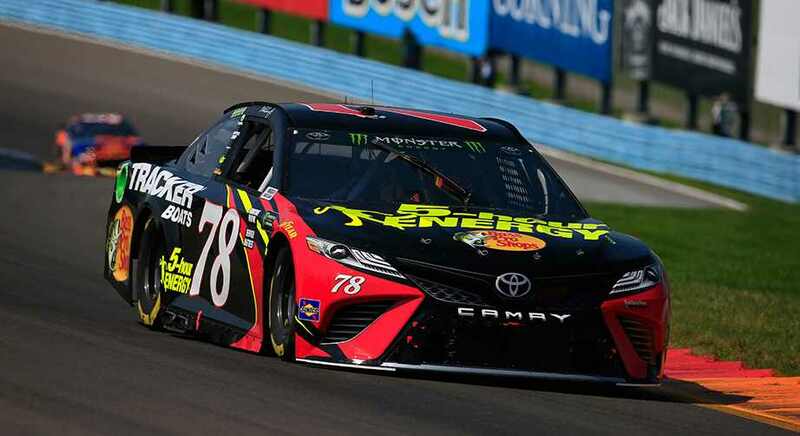 A driver outside the Top 16 in points winning at the Glen would throw a wrench into the playoff points qualifying hopes of those close to the cut line. Denny Hamlin(11) started on the pole. However, it took only 2 laps for Kyle Busch(18) and Martin Truex Jr.(78) to move past Hamlin into the top 2 positions. The other member of the “Big 3,” Kevin Harvick(4), started 15th. Ten laps in Harvick sat in 13th position. Early in the race Joey Logano(22), the winner of the Xfinity Race at the Glen, rammed the back of Kyle Larson(42). The minor accident damaged the radiator on Logano’s car. The team told Logano to take the car to the garage. They did not realize NASCAR had placed the 22 car under the damaged vehicle policy. Once it came to the garage the car was declared out of the race. A big mistake for the Team Penske crew. Logano finished 37th in last place. Stage lengths are 20/20/50. The race for Stage points versus pitting for track position will be a factor as drivers are able to pit without losing a lap. Many contenders opting to pit just before the end of the Stage scrambled the running order. Driver’s opting to pit early skipped the end of Stage pit stops and returned to the front of the field. Kyle Busch, Hamlin, Chase Elliott(9), Erik Jones(20), and Larson led the field to the green flag restart. 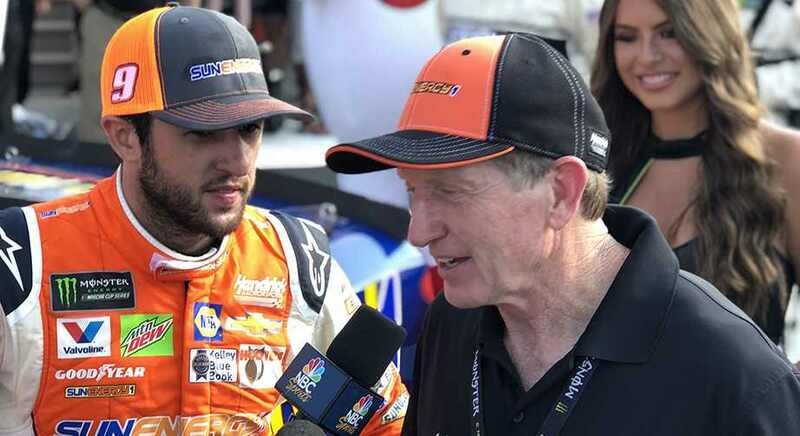 Stage winner Truex Jr. will restart 12th. At the drop of the green Kyle Busch pulled away. This time Elliott drove up to Busch’s bumper and would not let him get away. Elliott passed Kyle 2 laps later and began to open up a slight advantage. Elliott drove away to earn the Stage win. While a dozen cars stopped early near the end of Stage 1, few stopped before the end of Stage 2. In fact, most cars stayed on the track during the Stage ending caution. The strategy? Because the Cup cars can only run approximately 35 laps on a full tank. The 50 lap final stage requires a pit stop for more Sunoco Racing Fuel. Most teams chose to make it a 2 pit stop race. So, no need to stop a third time and lose track position. The final pit stop will likely determine the race winner. Elliott drove too deep into Turn 1 on the restart and allowed Kyle Busch to slip by. The two battled at the front of the pack while pulling away from the remainder of the field. With 37 laps to go Matt DiBenedetto(32) blew an engine bringing out the caution. Cars hit pit road with 35 laps to go, Kyle Busch and Elliott enter 1-2 and exit the same way. Elliott’s tire changer slides across the roof of the car as Elliott leaves a half a second early. Landing hard on the pavement the crewman, fortunately, avoids injury. Close to the fuel window drivers get instruction from crew chiefs to save fuel. Shutting off the engine and coasting can mean the difference between having enough gas to finish or coming up a lap short. Hamlin has a miscommunication with his crew and leaves the pit too early. He knocks a tire across pit road and catches an air hose with the left rear tire injuring a crewman. The loose tire sends him to the rear on the restart. Kyle Busch’s crew notices the tanks used to refuel the car are not empty. A fault in the gravity fuel system prevented the tanks from draining properly. Busch has to return to the pits to top of the tank or he will run out of gas short of the finish. He restarts at the rear of the field. 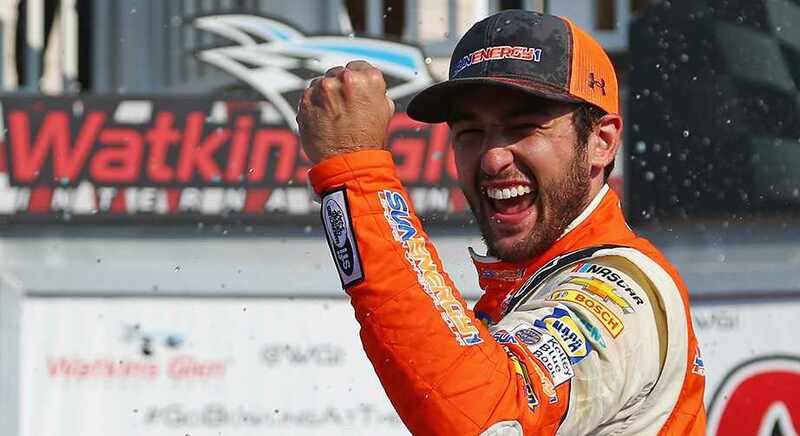 It’s now Chase Elliott’s race to win. He jumps out to a 2 second lead over Truex Jr. Byron, Michigan native Erik Jones sits comfortably in 3rd. Kyle Busch restarted in 24th. With 23 laps to go, he had moved back into the top 10. Busch returned to the top 5 with 11 laps to go. While at the front Truex Jr. moved to within 2 car lengths of the leader Elliott. Facing pressure from Truex Jr. on every lap, Elliott continued to run perfect circuits maintaining the slight advantage. On the final lap, Truex Jr. ran out of fuel as Chase Elliott pulled away for his first NASCAR Cup Series win. Elliott ran out of gas on the cool-down lap. Teammate Jimmie Johnson(48) pushed him back to front-stretch where he stopped to celebrate with his crew. After finishing 2nd 8 times, Elliott scores his first win in his 99th career Cup start. Kyle Busch finished 3rd, Daniel Suarez(19) 4th, and Erik Jones 5th. Kevin Harvick finished 10th. Elliott entered the race 14th in the points standings, 73 points above the cut line. His victory locks him into the playoff and takes some pressure off. 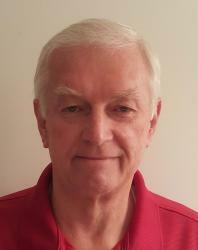 He was very likely to make the playoffs on points providing a major slump did not hit the team. Alex Bowman(24) increased his grip on the final playoff spot moving 58 points ahead of Ricky Stenhouse Jr.(17). Paul Menard(21) slipped out of a tie with Stenhouse Jr. dropping 12 points behind. Suarez pulled ahead of Ryan Newman(31) cutting his deficit from 96 to 86 points. Bowman will likely need a major failure to occur for any driver outside the top 16 a chance to break into the final playoff spot. The series returns to Michigan International Speedway next Sunday for a 2:30 pm start. 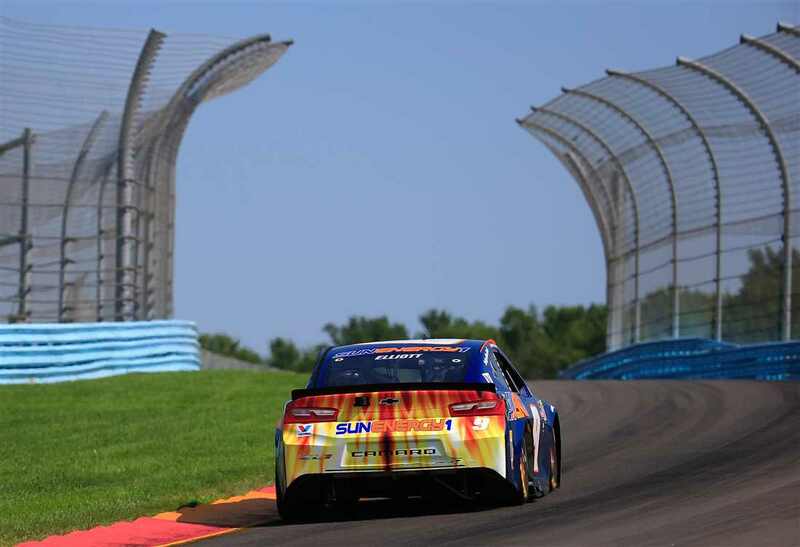 Tickets are available to experience the excitement of NASCAR racing in the Irish Hills. The Lasco Press will report Live from the track all weekend. Look us up and tell us your story. See you at the track.